At an early age Montgomery read widely. She started to write in school and had her first poem published in a local paper at the age of fifteen. In 1895 Montgomery qualified for a teacher's license at Prince Wales College, Charlottetown. During the 1890s she worked as a teacher in Bideford and at Lower Bedeque, both on Prince Edward Island. In 1895-96 Montgomery studied literature at Dalhousie University, Halifax. She returned to Cavendish to take care of her grandmother, and worked at a local post office. In 1911, after her grandmother died, Montgomery married Ewan MacDonald, the Presbyterian minister, and moved with him to rural Ontario. While caring for her grandmother, she wrote the first book of the Anne series. It drew on her girlhood experiences. The idea was based on a notebook entry from 1904: "Elderly couple apply to orphan asylum for a boy. By mistake a girl is sent them." Anne of Green Gables was the story of a talkative, red-haired orphan, Anne Shirley. The book became hugely popular, and the sequels followed Anne's life from childhood to adulthood. The initial volume has been filmed several times, adapted for stage and translated into some 40 languages. Montgomery's success was shadowed by a nine-year dispute with her publisher and her husband's bouts of melancholy. In 1925 the family moved to Norval, near Toronto, and then in 1935, after her husband's retirement, to Toronto. Anne of Ingleside (1939), the last volume in the Anne series, reflected Montgomery's disappointments in life. During the late 1930s Montgomery suffered a breakdown, and remained despondent until her death on April 24, in 1942. At her death she left 10 volumes of personal diaries (1889-1942), whose publication began in 1985. Montgomery wrote several collections of stories and two books for adults. Her other series characters include Emily, who appeared in three novels, and Pat, who was in two novels. Montgomery's heroines are frequently motherless, but adventurous, imaginative and determined. Anne Shirley from Anne of Green Gables has a fiery temperament, to do with her red hair. 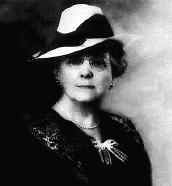 After becoming tired of Anne, Montgomery created Emily Byrd Starr, who has dark hair and loves nature and writing. Anne's imagination leads her into conflict with her surroundings, but Emily uses her imagination to compose poems and stories. In the third part, Emily's Quest (1927), Emily publishes her first book, is confused by reviews, which are conflicting, and marries Teddy Kent, an artist. The story of an orphan, Anne, who is sent, by mistake, to live with a lonely middle-aged brother and sister on a Prince Edward Island farm. As her childhood friends get married and move away, Anne leaves Prince Edward Island for Redmond College in Kingsport. Anne marries Dr. Gilbert Blythe, and they leave Avonlea to begin their lives together. A continuation of "The Story Girl," details Sara's return to Carlisle and decides to publish a magazine.